You don’t have to be a pro to tackle many home improvement projects. With a little elbow grease and a few smart tools, DIY novices can easily complete all kinds of household tasks efficiently and correctly. Here are 10 common DIY projects for beginners that any homeowner (or apartment dweller) can learn to do. Not only will your house look great, but you’ll feel a great sense of pride too. 2. Loosen Rusty Bolts: For stubborn nuts and bolts, reach for a Bernzomatic TS3500 Multi-Use Torch. This easy-to-use tool empowers all levels of DIYers and can be used for dozens of tasks. 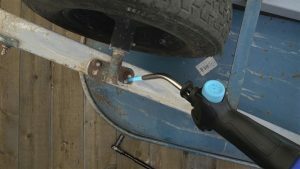 For this one, simply heat up the bolt to loosen the rust, then turn with a wrench to remove. Discover more torch project ideas at Bernzomatic.com. 4. Give Furniture A Vintage Look: The rustic look is “in,” but rather than splurge on trendy furniture, get the same look for less money and have fun creating it yourself. Add an aged look to wooden types of furniture such as patio sets or console tables, or decor items like picture frames using a torched patina effect. The Bernzomatic TS3500 Multi-Use Torch provides ultimate control for steady strokes back and forth on raw wood to bring out the natural wood grain without having to apply a stain. It only takes seconds. 5. Create A Perfect Patio: If you want a new patio, but don’t want to deal with mortar, consider flagstone. These flat stones fit together like puzzle pieces so you can create a small patio, meditation garden or reading nook virtually anywhere in your yard. 7. Eliminate Picture-Hanging Snafus: When hanging small pictures, put masking tape on the wall before hammering or drilling. This will help ensure the wall or paint doesn’t crack. Additionally, place a folded sticky note on the wall before drilling and it will catch all the dust. 8. Spruce Up Landscaping Beds: If your landscaping is looking drab, mulch is an affordable way to limit weeds and protect plants while making the space more visually appealing. Use cut-outs of landscaping fabric to line the beds before spreading mulch evenly on top. Quick trick: use a torch to singe the ends of the fabric to keep it from fraying.